I’ve read a book on on how actually accomplish this task, as well as any article I come across. So far, it seems that our best bet is the one-parent-one-language method: I speak only Spanish to the kids, and my wife speaks only English. One limitation I see is that couples who use this method usually consist of one native speaker of each language. I am not a native Spanish speaker. I developed a pretty decent command of the language in the years after my mission when I was minoring in Spanish and spending a lot of time hanging out with my Argentine buddy and many of his latino friends, but since then it’s been a downhill slide. I’m somewhat concerned about my kids learning to speak ghetto gringo Spanish. Another problem is that my wife speaks very little Spanish, so she’ll be kept in the dark or require translating when I’m conversing with the kids. That’s going to require some patience. So I’ll speak and read to them in Spanish (maybe even sing, if no one else is around :D). And although my Spanish has been kind of neglected lately, I am expecting my tongue to loosen right up as I oil those rusty hinges by getting back into the practice of speaking the language regularly. I’m also figuring that my kids should hear Spanish from someone else apart from dad. I’m hoping to fit in some videos and music in Spanish. 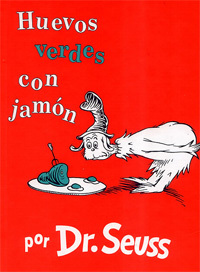 We will probably get a few kids books in Spanish as well, which will help once the kids are old enough to read. I’ve read that many people seeking to rear their kids in two languages encounter a lot of blowback from well-meaning yet uninformed neighbors or family. Apparently there are many people who think that learning a second language is a waste. However, along the Wasatch Front, there are lots of people who spent time among other cultures and learned to speak foreign languages, so I sense that there’s a lot more appreciation for the utility and the enjoyment of being able to communicate in a language other than English. There are also many people that wonder if being assaulted with two languages will confuse the young children or hamper their ability to learn English. I’ll hopefully be informed enough on the research to answer these questions and explain a little bit about the studies and how they show that this concern is unfounded. By far the most common react I’ve seen personally when I tell people I hope to speak only Spanish to my kids is eye-rolling. I think that many people view this as some kind of weird science experiment or glorification of my mission days or of my ability to speak Spanish. Hopefully those types will come around eventually and be supportive, because I’m going to need it. …Because I’m getting the sense that it takes a ton of disciple to stay on task. I’ll be so tired that I’ll just get lazy and speak in English. Or we’ll be fed up that my wife or people around us are excluded from conversations. In any case, there are sure to be many obstacles, but I’m absolutely convinced of the great benefits of being bilingual, and I hope to give my kids every leg up in life that I can.